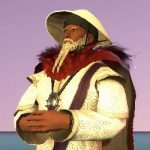 Discussion in 'Player Created Resources' started by Adrian (Kung Fu Master), May 18, 2018. But wait! There is more! I wanted to save the best for last because this is what makes farming so enjoyable in SOTA, at least for a few of us. Ladies and Gentlemen, I'm going to introduce you to the Vertical farming techniques. Yes, it’s true because Vertical farming does exist in SOTA. 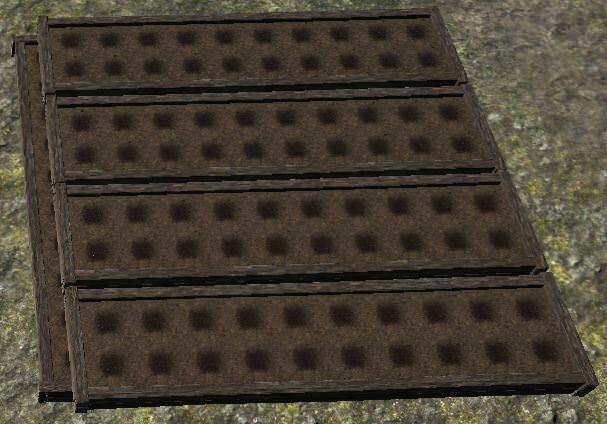 It allows you to plant more seeds in a limited space with less time. According to Albert Einstein, space and time always go hand-in-hand; therefore, you get to plant more seeds in the same area with less time spent sow/water/harvest. The key to this lesson is to maximize using your "3D" space. 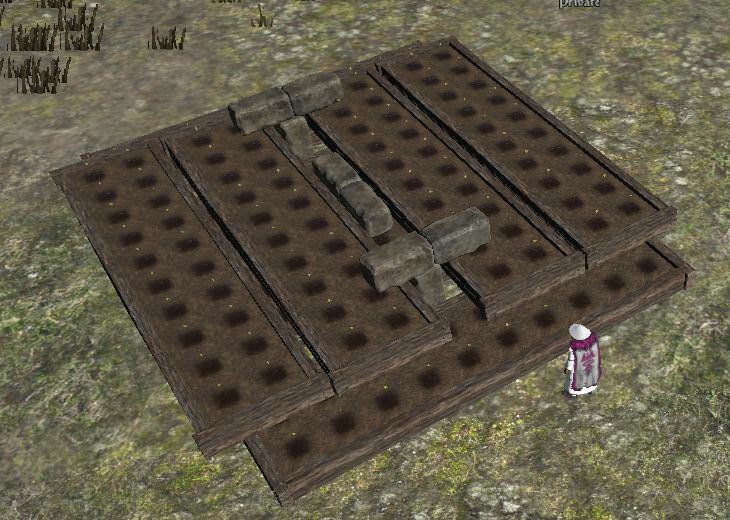 Vertical farming requires you to learn Smelting skill to make pedestal and cube blocks. These will elevate your planter beds and pot. Below are some of my techniques and recommendations for you. Feel free to try these on your farm/home/basement/greenhouse. Technique 1. Doric Column Pedestal. a. The pedestal are great at corners and along the walls/edges. 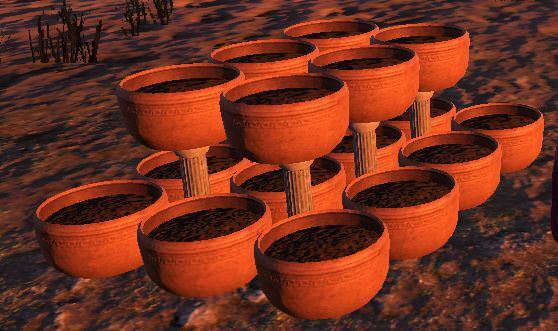 I like to lay my pots in a honey comb pattern to maximize the floor spaces and columns at the wall/corners. 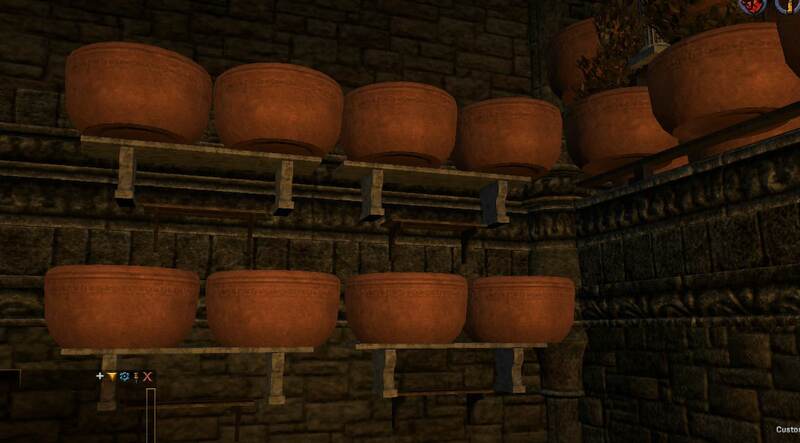 Place the pots on top of the pedestals along the walls and corners. 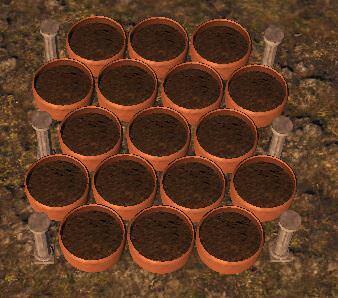 a. Additionally, you can lay the pots side-by-side in a normal pattern, and place pedestals in between the gaps. 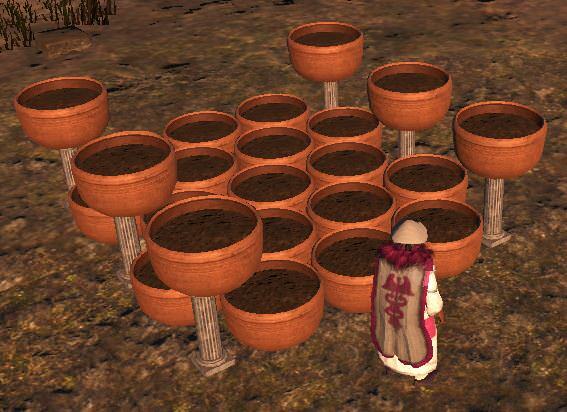 The trick is to lay the pots down one row at a time, and place the pedestal at 45 degree. 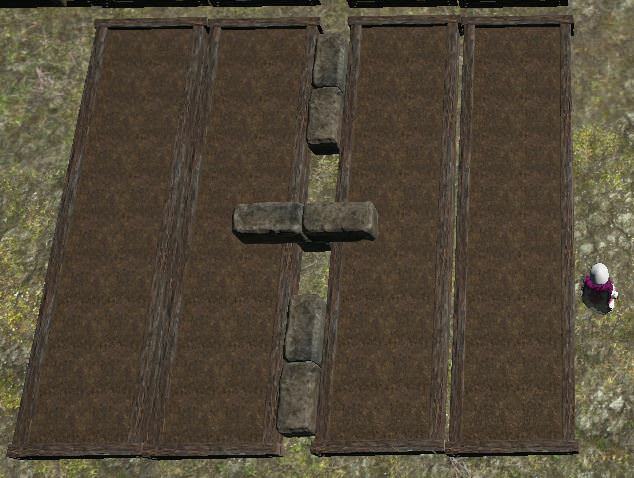 As you can see below, you can gain about 50% more crops by using vertical farming layout. Conclusion: You can use thess pots/pedestals in many tight spaces such as greenhouse and basement. 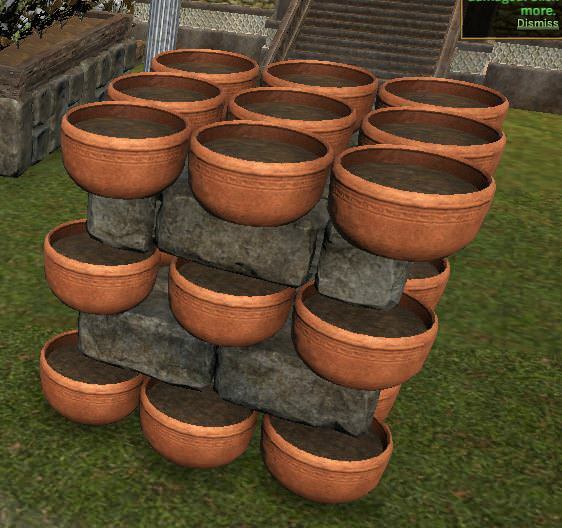 For the record, I had placed 150 pots in a 4-story Row Greenhouse using this technique. 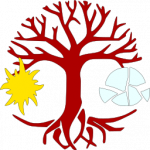 Technique 2. Rough Stone Blocks. Rough Stone Blocks are great at elevating your pots and planter beds. 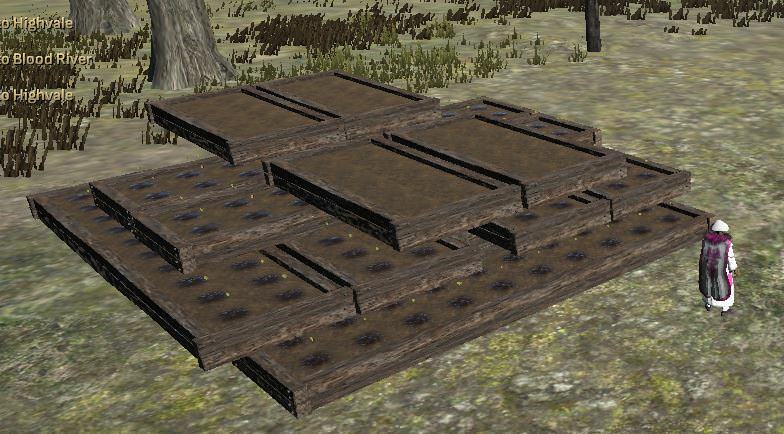 Just place your planter beds on top of the blocks. No need to explain, the pictures below will speak for themselves. b. Lay the 1x4x1 block down, and lay two planter beds on top to be side-by-side. d. Mix: 1x1x1 and 1x4x1 blocks. This is my all time favorite technique. You can have 200 plants in a small area and still have 100% farming effectiveness. One watering round can triple your traditional technique. e. This technique, you can have 240 plants in the same area. I would discourage using this technique due to the loss of farming effectiveness as you go higher in elevation. Conclusion: This technique only work inside a greenhouse and on empty lot. For some reason, it work best in a swap POT. For the record, I have 189 planting spot inside the 4-story Row Greenhouse with this technique. MISC. These are some techniques that I came up. I find they are useful depend on your farming taste and condition. Another best kept secret. Work best in the basement and you can grow on your wall as well. Use a wall shelf and place the stone bench on top. Place two pots on top of the bench. Now you have reached Enlightenment! There is nothing much you can learn from me at this point, Master Farmers. I will see you at the Grandmasters' finish line. Please feel free to share your discoveries and techniques with us. 3. The higher elevation you go up, the less sow/water/harvest effectiveness you would receive. Imagine it's like a funnel shape as you go higher, not as a cylinder shape. 5. 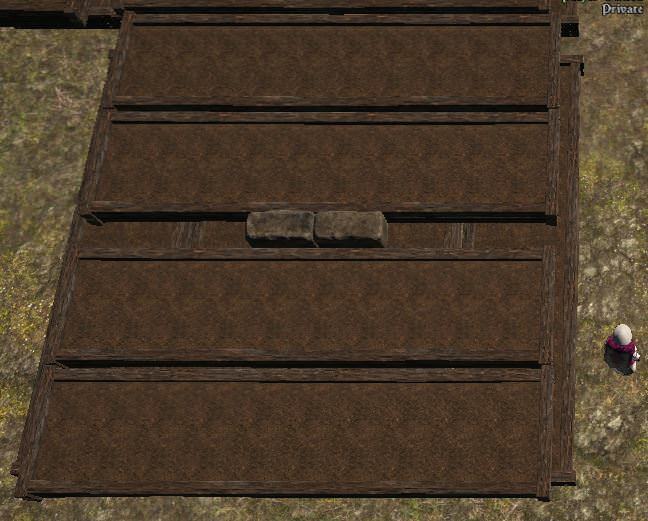 If you can't place your planter beds on top of the blocks, place them inside a Rusted Iron Greenhouse. Remove the greenhouse when you are done stacking. (This tip came from a good friend of mine, Master Farmer @tyorl999 ). 6. For outdoor Vertical farming, it works best in a swamp environment POT's without having to use the Rusted Iron Greenhouse trick. 9. When you're running out of spaces in your basement and indoor, try farming on the walls. 10. If you have an Arena basement, you can place the pots and pedestals on top of the safety hand rails. 11. Basement farming works better in 5-Story Stone Basements than the Stone & Timber and Arena basements. 12. Ensure to test out your farm in the QA server before you do it in the Live server. Arianna, Black Tortoise, ozzzmosis and 17 others like this. Planting pots + pedestals is quite creative, but it looks like the best case you can squeeze out about a 75% efficiency on planting space to deco #, and the wall shelves is only 50%. You're passing 86% efficiency with the 4x4x1 pot stacking, I like that, and it looks like the most efficient for basement farming. 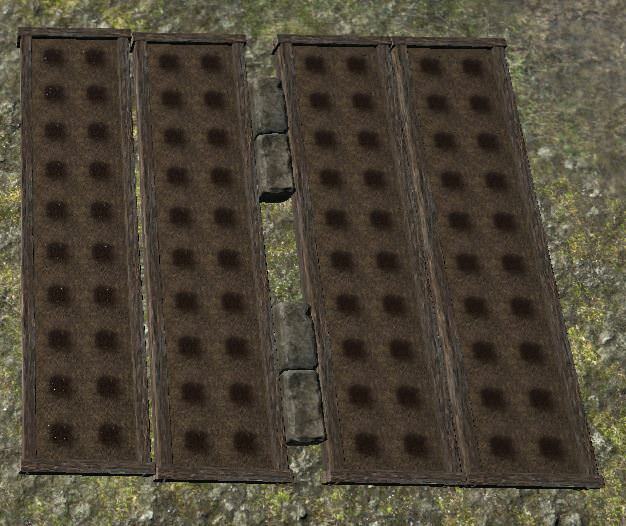 Otherwise I can fit 800 planting spots in the first floor of a stone city basement without vertical stacking. That's obviously not good enough for me, haha, not when I have 2300 greenhouse accelerated plots I'm already working. Edit: I can't seem to reproduce this block stacking, what's the trick to get the 4x4x1 to sit on top of a 1x1x1? Elrond and Roycestein Kaelstrom like this. It's obvious we would never get 100% efficiency in planting with supporting blocks and pedestals. By using blocks and pedestals, one would never reach 100% of planting spots. But a 90% solution is better than 70%-80%. What I'm trying to point out is that efficiency in saving time by not walking around harvest/sow/water but can still achieve 90%+ efficiency. Here is how you can get a 4x4x1 to sit on top of a 1x1x1. (This can be very hard to master at first, but it would become easy as you get a hang of it). 2) Lay one 4x4x1 down, lay 1x1x1 next to it, lay a second 4x4x1 next to the 1x1x1 block. 3) Lay the last 4x4x1 on top of the 1x1x1 block. 5) To move it around, only move the 1x1x1 block and the 4x4x1 will come with it. Roycestein Kaelstrom, Ben_Hroth, Sonja and 1 other person like this. I agree about the compromises, my city lot uses 920 out of 1000 for plants for that exact reason. I apologize for the briefness of my last post, it was a long week and I was posting just before I went to bed. I'll play around with the blocks, thanks for the detailed tip! Roycestein Kaelstrom, Sonja and Adrian (Kung Fu Master) like this. Ah, thank you for the update on deco limit. I didn't see/catch it in the R54 notes. Now we can farm more with less lands Expect to gain an additional 12.5% increase to total outputs. Roycestein Kaelstrom and Drake Aedus like this. Indeed, the first thing I asked myself was if I could fit another 20 spots in a greenhouse, lol! I for one have tried to reproduce any of the pictures you give us with the planting beds, but I can't manage these at all. 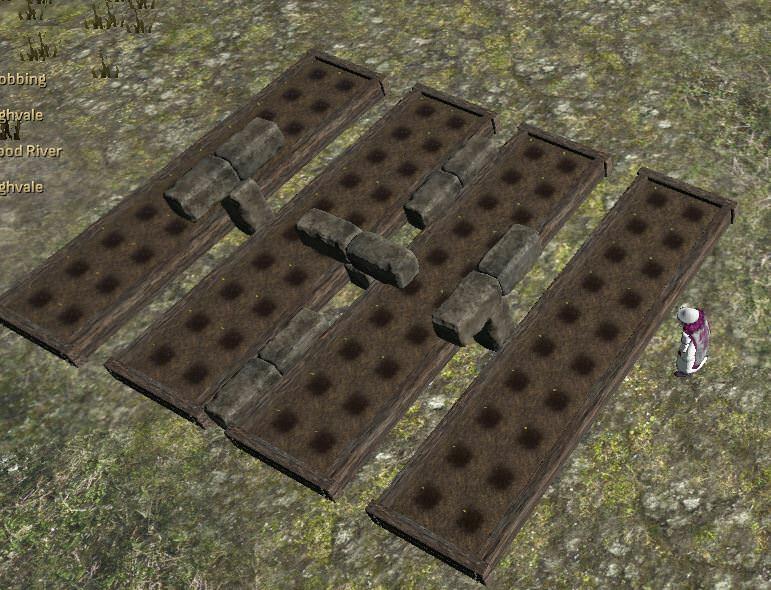 I don't understand what I am doing wrong (and I clearly am doing something wrong ) but I can't seem to make planting beds stand on the rough blocs! Is there something special I need to do to make it work? Are you doing it upstairs and on open ground? Plus keep in mind that objects have a point that is an "anchor" that determines where it sits. 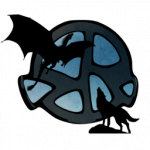 Try and get the center of the plot to sit on the block. Try to do it while you're in an rusted iron greenhouse. Once you're completely done setting up the way you wanted, remove the greenhouse...and "VOILA". 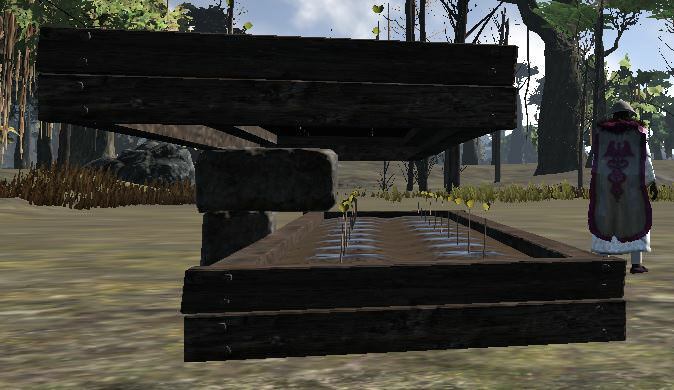 You can go to the QA server and test it out in Brittany Fort town (Swamp town), it works like a charm without the use of a greenhouse. Roycestein Kaelstrom and Sonja like this. Roycestein Kaelstrom and Adrian (Kung Fu Master) like this. I hope you don't mind me inserting your name in tip #5 . Give credit to your discovery. I tend to fool around on QA. I would never use this on Live (as it is a horror to look upon, ala R'lyeh). Black Tortoise, Roycestein Kaelstrom, Elrond and 2 others like this. It looks great, I really like it. Give it some time to grow on you. The only way for you to do this in a Row Greenhouse is to place the row in a swamp POT. 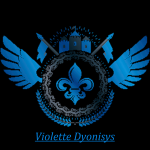 You can try this in the QA server by moving to Brittany Fort. I haven't figure out how to do it in the other Forest POTs. Do you offer in-game classes? I wanted to do the "Misc" one of 2 planting beds on the side of my fence on my town lot atls it looked good and helped me reach my goal of a self paid lot with a house and Deco, but even trying it out on an empty lot never made it work, and I don't feel ready to redo my whole Deco again (even if it's nothing compared to most others). So I would love to assist an in-game class or even pay you to set it up on my Lot! FYI all, Marcus is in an Island POT and it does not work in open lot. Need to do the Rusted Iron Greenhouse trick. Interested in trying out this Vertical Farming method, but have to ask... Has this method been approved of by the Devs ? 1) It is a sandbox game. 2) I have shown off my greenhouse setup with the developers and have not had any problems. Don't be fooled, it is still a large time and gold investment to make. This is not an easy payout. I feel like I would make more profits grinding sieges, but I have a fondness for the agriculture system and always hope it gets expanded more. Roycestein Kaelstrom, Sonja, Ulskanine and 1 other person like this. It’s still follow all the rules deco limit and border lines so it’s not an exploit. Devs would have said something by now if they disapprove it. It’s more of an improvement method to the way we farm. Roycestein Kaelstrom and Ulskanine like this.